The rates of childhood obesity have more than doubled in children and quadrupled in adolescents over the past 30 years, with nearly 32% of young people between the ages of 2 and 19 years-old found to be either overweight or obese. The American Academy of Pediatricians is encouraging physicians to take a more active role in preventing childhood obesity by offering doctor guidelines to help families before a child’s weight problem becomes critical. Previously, the approach towards childhood obesity had been largely treatment-related since, according to pediatrician and chair of the AAP Section on Obesity Stephen Pont, “a doctor’s intervention may be significantly delayed because most health insurance plans do not recognize childhood obesity as a medical condition, and therefore will not pay for its treatment unless the child develops serious complications.” The newly revised guidelines urge doctors to adopt an active role in advising a family-focused approach to healthy living, including choosing healthful snacks and drinks, locating and utilizing local, nutritious sources of food, encouraging children to partake in at least 60 minutes of exercise a day, limiting screen time, and making sure children get adequate sleep. The guidelines point out that instilling healthy behaviors before a child’s health begins to suffer is more effective than waiting to treat a child and attempting to reverse damaging habits later on. The family-centered approach could also have the added bonus of the entire family adopting a more sustainable, supportive, healthful lifestyle. The rates of childhood obesity have more than doubled in children and quadrupled in adolescents over the past 30 years, with�nearly 32% of young people between the ages of 2 and 19 years-old found to be either overweight or obese. The American Academy of Pediatricians is encouraging physicians to take a more active role in preventing childhood obesity by offering doctor guidelines to help families before a child's weight problem becomes critical. 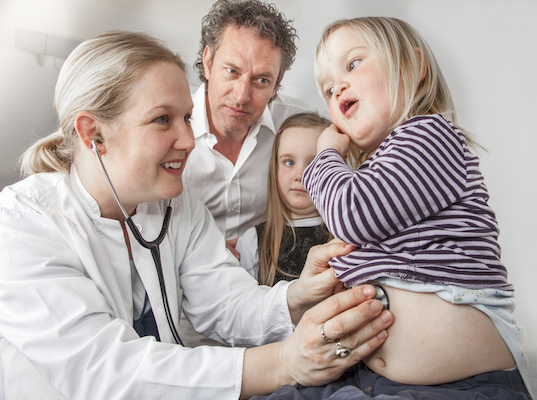 Previously, the approach towards childhood obesity had been largely treatment-related since, according to pediatrician and chair of the AAP Section on Obesity Stephen Pont, "a doctor's intervention may be significantly delayed because most health insurance plans do not recognize childhood obesity as a medical condition, and therefore will not pay for its treatment unless the child develops serious complications." The newly revised guidelines�urge�doctors to adopt an active role in advising�a family-focused approach to healthy living, including choosing healthful snacks and drinks, locating and utilizing local, nutritious sources of food, encouraging children to partake in at least 60 minutes of exercise a day, limiting screen time, and making sure children get adequate sleep. The guidelines point out that instilling healthy behaviors before a child's health begins to suffer is more effective than waiting to treat a child and attempting to reverse damaging habits later on. The family-centered approach could also have the added bonus of the entire family adopting a more sustainable, supportive, healthful lifestyle.